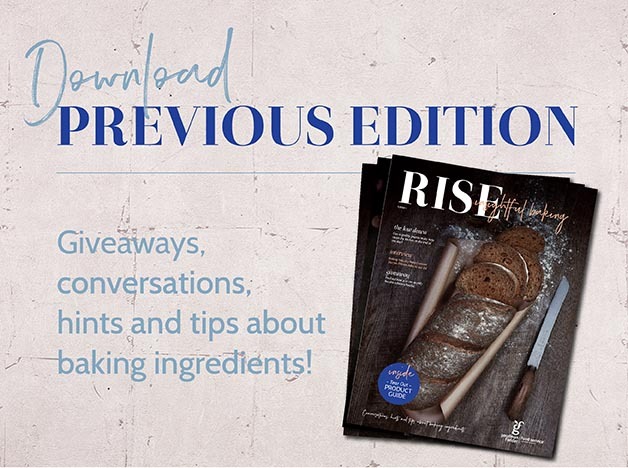 Make Rise Insightful Baking Your Magazine Must Have! Each page of the magazine is dedicated to providing you with news, insights and updates from the baking industry. 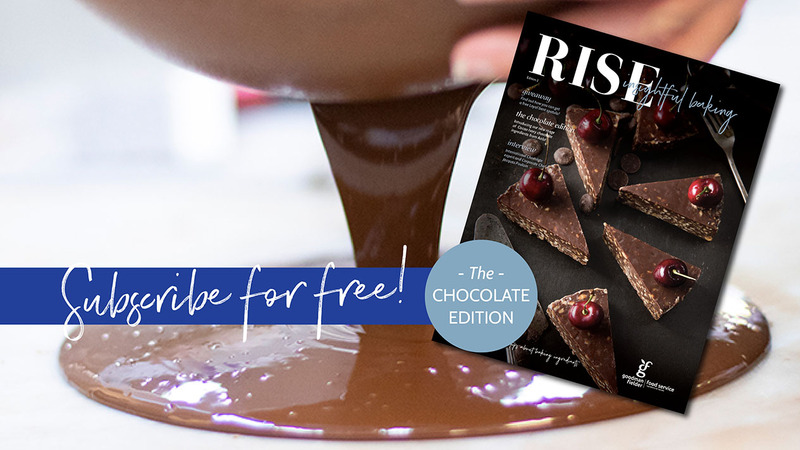 With feature and trend articles that aim to inspire and engage your creative juices including new recipes, application ideas and tricks of the trade, download previous editions of Rise Insightful Baking magazine anytime you need a reference point. Do you have a bright idea you’d like to share or a topic you’d like us to explore? Get in touch now for your chance to feature in the next edition of Rise Insightful Baking Magazine. Giveaway: Instructions on how to claim and the gift form part of these Terms and Conditions. Participation in this giveaway is deemed acceptance of these Terms and Conditions. Gifts are not valid in conjunction with any other offer. How to claim gift: To claim the gift, you must, during the Giveaway Period, head to https://www.gffoodservice.com.au/promotions/bakers-bench follow the prompts to fill out the form to subscribe to the Goodman Fielder Food Service website and Rise Insightful Baking Magazine. You are not permitted to use any automated entry software or any other mechanical or electronic means that allows you to automatically enter. You are responsible for any associated costs such as internet access. Only one gift per business allowed. Giveaway period: Giveaway commences at 9:00am AEDST on 30/04/2018 and ends at 11:59pm AEDST on 31/05/2018 (“Giveaway Period”). Promoter’s rights: The Promoter reserves the right, at any time, to verify the validity of an entry and Eligible Businesses and reserves the right, in its sole discretion, to disqualify any individual who the Promoter has reason to believe has breached any of these Terms and Conditions, tampered with the claim process or engaged in any unlawful or other improper misconduct calculated to jeopardise fair and proper conduct of the promotion. Errors and omissions may be accepted at the Promoter’s discretion. Failure by the Promoter to enforce any of its rights at any stage does not constitute a waiver of those rights. The Promoter’s legal rights to recover damages or other compensation from such an offender are reserved. The gift: Each entrant will receive 1 x Metal bakery scraper with black handle and laser engraved with Goodman Fielder Food Service. Gifts are not transferable, changeable or redeemable for cash, unless otherwise set out in the Terms and Conditions. The Promoter reserves the right to provide an alternative prize of equal monetary value in the event that a prize or any part of a prize becomes unavailable for any reason beyond the Promoter’s control. Receiving gift(s): Each Eligible Business should allow up to 4 weeks after their entry is submitted to receive their gift. Only one gift per business allowed. Promoter does not accept any responsibility for any gift being lost, damaged or destroyed in transit. If the gift is unavailable, the Promoter, in its discretion, reserves the right to substitute the gift with a gift to the equal value and/or specification, and the Eligible Business will be notified accordingly, subject to any directions from a regulatory authority. Gifts are not transferable or exchangeable and cannot be taken as cash, unless specified otherwise by the Promoter. The total value of each gift $5.50. If this promotion is interfered with in any way or is not capable of being conducted as reasonably anticipated due to any reason beyond the reasonable control of the Promoter, including but not limited to technical difficulties, unauthorised intervention or fraud, the Promoter reserves the right, in its sole discretion, to the fullest extent permitted by law (a) to disqualify any Eligible Business; or (b) subject to any written directions from a regulatory authority, to modify, suspend, terminate or cancel the promotion, as appropriate. Nothing in these Terms and Conditions limits, excludes or modifies or purports to limit, exclude or modify the statutory consumer guarantees as provided under the Competition and Consumer Act, as well as any other implied warranties under the ASIC Act or similar consumer protection lawsin the States and Territories of Australia (“Non-Excludable Guarantees”). Except for any liability that cannot by law be excluded, including the Non-Excludable Guarantees, the Promoter (including its respective officers, employees and agents) excludes all liability (including negligence), for any personal injury; or any loss or damage (including loss of opportunity); whether direct, indirect, special or consequential, arising in any way out of the promotion. Exclusions: Except for any liability that cannot by law be excluded, including the Non-Excludable Guarantees, the Promoter (including its respective officers, employees and agents) is not responsible for and excludes all liability (including negligence), for any personal injury; or any loss or damage (including loss of opportunity); whether direct, indirect, special or consequential, arising in any way out of: (a) any technical difficulties or equipment malfunction (whether or not under the Promoter’s control); (b) any theft, unauthorised access or third party interference; (c) any claim that is late, lost, altered, damaged or misdirected (whether or not after their receipt by the Promoter) due to any reason beyond the reasonable control of the Promoter; (d) any variation in gift value to that stated in these Terms and Conditions; (e) any tax liability incurred by an Eligible Business; or (f) use of a gift. The Promoter: is Goodman Fielder Consumer Foods Pty Ltd, (ABN 35 000 024 546) at Level 4 &5, 40 Mount Street, North Sydney NSW 2060.